Our amazing time in Vietnam is slowly coming to an end. From the traditional hill tribes of Bac Ha and Can Cau to hip Hanoi to magnificent Halong Bay, the North is just as impressive as South and Central Vietnam. Although we are sad to leave, we are more than happy to have explored this diverse region. Follow along in our 4-minute video and see for yourself, why you should definitely be planning a trip to Vietnam in the near future. Like miners prospecting for that legendary vein of gold, Thomas and I have been scouring Vietnam for culinary treasures. 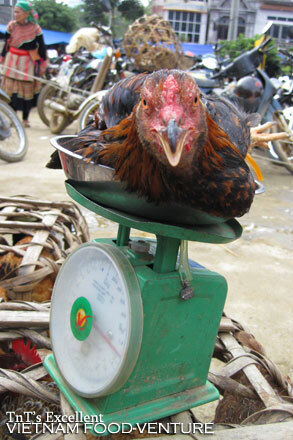 When we finally set foot into Quan An Ngon, I screamed, “Eureka!” – well, at least mentally. 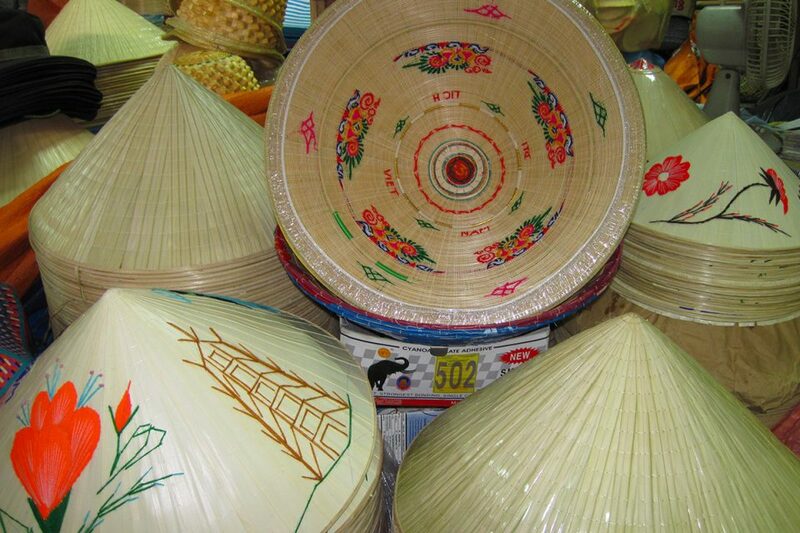 Vietnam would be a dirt-cheap country – if visitors could only pay the local prices. But more often than not, tourists are charged inflated rates for pretty much everything. With this in mind, we had to really kick it up a notch and work the Vietnamese with our superb bargaining skills. 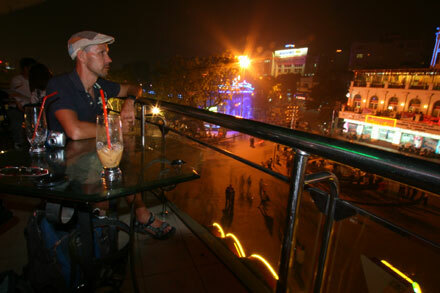 Hanoi is full of cool, cutting edge, trendy little bars and cafes that can stand up to those in any world capital. Less pretentious and better value than similar establishments in other major cities, it’s no wonder Hanoi attracts travelers in droves. And believe me, they are here in droves! Unfortunately for those who love to stay up all night, the government restricts how late things can stay open, so start early and pretend you’re Cinderella. Hanoi is one of Southeast Asia’s most stylish cities. 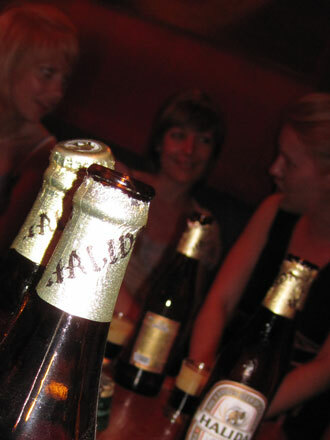 It’s hip, dynamic, walkable, historic, trendy, picturesque and very, very enjoyable. Ten minutes after arriving, we were dedicated fans of Vietnam’s sensationally chaotic capital. Whether strolling through the atmospheric Temple of Literature or squatting on a plastic chair at a corner coffee stall, this place represents Asia at its best. 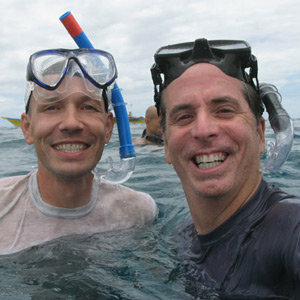 On day one, I was already in serious panic mode that we had so little time here. (I just might need a year.) Seriously, we would need weeks to explore the city’s back streets, markets, temples, museums, and restaurants. And there are endless possibilities for excursions into the surrounding rural areas. But despite my obsessive need to see everything, each time we step out of the hotel, the city’s cool cafes and coffee houses lure us in and lull us into do-nothing mode as we sit for hours people watching. Sometimes, while traveling, you discover foods which are so delicious that you will never again be happy without them. Banh cuon is one of those foods for me. The paper-thin rice flour pancake is prepared on a cloth covering a steaming pot of boiling water. 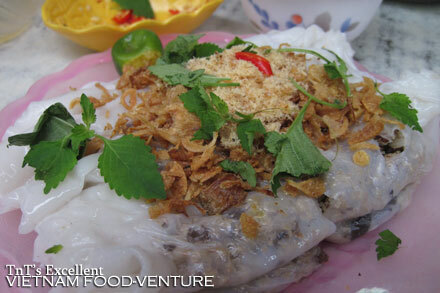 Filled with ground pork and diced wood-ear mushroom, banh cuon is then chopped and topped with fried onions and chili. If you want to eat your banh cuon like a pro, order up a side dish of cha lua, a delicious Vietnamese sausage. And don’t forget to rip up some mint leaves and throw them in with your nuoc cham, the tangy dipping sauce. Yum, my mouth is watering as I write this. I think I’m going to go have another one right now!!! A cruise through Halong Bay is certainly the highlight of any visit to northern Vietnam. The phenomenal string of jungle-covered karst islands rivals the surreal beauty of similar landscapes in Thailand, Laos, China and the Philippines. To the south of Halong, stunning Cat Ba Island beckons travelers with limitless possibilities for kayaking, hiking, or lounging on white-sand beaches. Thomas and I had the extraordinary luck to share our amazing Halong experience with a fantastic group of fellow travelers on the Imperial Deluxe Junk. Beautiful suites, excellent food, and great company, what more could we ask for? Our three day trip through Halong Bay and neighboring Lan Ha Bay featured stops at the Hang Sung Sot caves and the national park on Cat Ba Island as well as an overnight stay on the idyllic hideaway of Monkey Island. Our experience was superb. 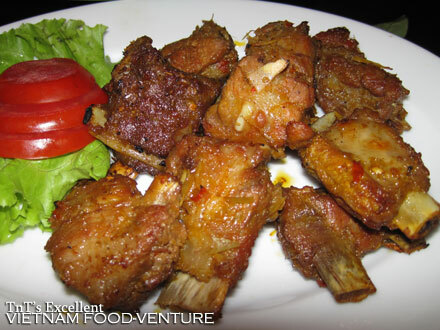 We didn’t want you to think that a Vietnam Food-Venture comes without its challenges. 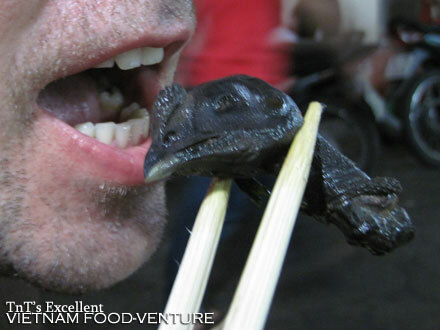 Sometimes, the deep-fried frog isn’t quite up to your expectations or the stir-fried rabbit seems a little uninspired. Was that freshwater eel nothing but bones? Bummer. Those trapped in a train for 24 hours might survive on fried guppy and white rice. 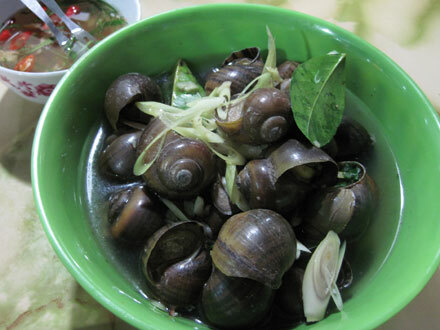 Escargot fans will discover that Vietnamese snails are a bit flavorless – there’s a reason the French drown them in garlic butter. And that chicken head in black sauce tasted a little like run off from a Chinese herbal shop. Oh well – no pain, no gain. 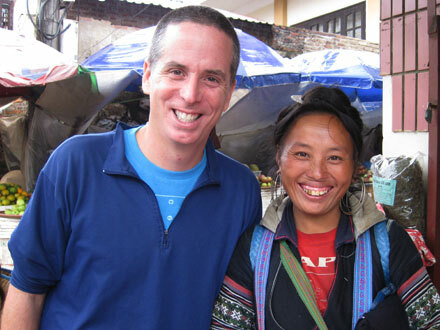 For many visitors, beautiful Sapa can be a little annoying with all the tribal women accosting you in the streets to buy souvenirs. But behind the sales pitch are real people struggling to make a living in a world that offers little opportunity for tribal communities. Chu, a feisty little Black Hmong woman, followed us through the streets trying to sell us bracelets, postcards, whatever. She tried all her cleverly designed sales pitches and edgy one-liners without any success. Somehow, our resistance to her spiel seemed to intrigue her. She even labeled me “Mr. No.” Over the course of the day, we encountered her several times and eventually spent some time talking to her. What struck me most was how intelligent and witty she was. Her English language skills were exceptional and, in another world, she would have been a high-powered business woman, a politician, or a scientist. Instead, she travels the long distance from her village to Sapa every day to stalk tourists and earn a little money to help maintain her family. Good for you, Chu.